Dead Alligator Found: How did an alligator end up in Lake Wylie? BELMONT, NC (WTVD) -- An unusual discovery was made in Lake Wylie on Sunday: an alligator. 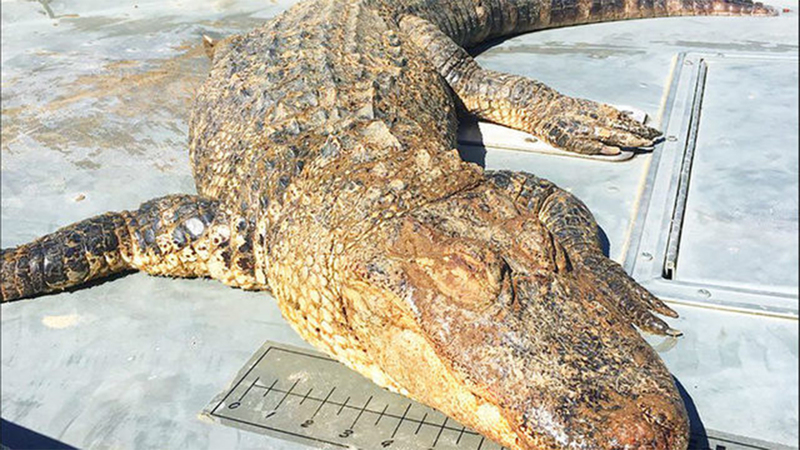 A 4- to 5-foot-long, 45-pound gator was found dead in Lake Wylie near the Highway 74 bridge in Belmont. Jacob Cannon said that he was hanging out with friends Saturday night at Belmont's Loftin Riverfront park when he saw the reptile. "It was swimming out toward the bridge and just circling and I just said, 'That ain't no otter.' I got outta there," Cannon said. The next day, Antonio Figueroa and his brother were fishing on their kayaks when they spotted the gator. "All of a sudden he flew out his line and the next thing you know, it's a gator," Figueroa said. But as Figueroa and his brother got closer, they saw the gator was dead. On Tuesday officers from the North Carolina Wildlife Commission pulled the alligator from the waters. They said gators are natural in the Catawba River near Lake Wateree, but getting that far past all of the dams is very unusual. "I can't really answer how it got here. It could've been released. More than likely it was released but we don't know that," Cody Walker, with the North Carolina Wildlife Commission, said. Another reason why experts believe the alligator was taken care of by somebody is because it's a lot wider than a typical American alligator, which suggests it has been fed by somebody. Biologists are investigating how the alligator died.